Buried in the trees behind the fence at the back of our yard, there was a chicken house which opened onto the cow pasture on the other side. It belonged to our landlady. When we first rented the place, I used to pass by it regularly on my way to the pond at the bottom of the pasture slope. A ramshackle structure made of wood with a door latch tied shut with a string, the chicken house sat low on the pasture side under the sky, surrounded by broken pieces of old farm equipment scattered and piled every which way. Approached from the overgrown garden path, it rested among flickering shadows of yellow and green leaves, with shafts of sunlight and small breezes filtering through. When we first moved in it was empty, and I, a lifelong suburbanite, gave scarce thought to what manner of life it had housed before our coming. Peering through the dusky screen at the garden end, I could see a compacted dirt floor with a large metal cylinder in the middle, and over at the far end, a low shelf crammed to the roof with junk. Stray wisps of white feathers lay about, some lifted up by the breeze. One July day on my way to the pond I stopped short. Through the leaves, I thought I saw white forms moving around on the other side of the screen. Listening, I thought I heard voices. A moment later I was staring through the screen. 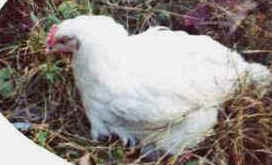 White, young-looking chickens covered the ground. Several, when they saw me, came over and sank down in front of me. Back then I knew almost nothing about chickens, but I could see that their legs weren’t right. They tended to be thick and swollen with the toes curling inward and outward in odd sorts of ways. Many could barely make their way to the metal feeder which stood at a considerable distance, under the circumstances, from the water trough rigged up along one wall. A few fumbling steps and they would sink down on their broad, heavy breasts, their eyes peering at me. From then on I used to visit the chickens almost every day, wondering dimly as to their ultimate fate. One morning in late August I went out to see them as usual. Only, this time the place was deserted. Then I saw her. – Careers in the Poultry Industry: A Job is Ready When You Are. She was stumbling around over by the feed cylinder on the far side where the low shelf piled with junk made everything dark. A shaft of sunlight had caught her, but by the time I was able to get inside she had scrunched herself deep in the far corner underneath the shelf against the wall. She shrank as I reached in to gather her up and lift her out of there. I held her in my lap stroking her feathers and looked at her. She was small and looked as if she had never been in the sun. Her feathers and legs and beak were brown-stained with dirt and feces and dust. Her eyes were as lusterless as the rest of her, and her feet and legs were deformed. I let her go and she hobbled back to the corner where she must have spent the summer, coming out only to eat and drink. She had managed to escape being trampled to death, unlike the chicken I had found some weeks earlier stretched out and pounded into the dirt. I made her a bed by the stove, close to our kitchen table. We named her Viva. Neurotically adapted to corners by now, Viva would hide her head in whatever closest corner she could find inside the house, or if outside she would often stick her head under a bush or pile of cut grass and just stay that way. Despite this, she liked to be outdoors. To see her sitting among the bright leaves scattered over the grass in the autumn sunshine, you would not have guessed what her legs and feet were like. Yet she liked to move around. When we first had her she used to cover a surprisingly wide territory in spite of her hardship, for though crippled, she was quick, and I would sometimes catch her hobbling vigorously to some point or other straight across the yard with her little wings fluttering. She used her wings for balance in order to get about. To steady herself, and to keep from falling, she would spread them out so that the feather ends touched the ground, and standing thus, she would totter from side to side in a painstaking adjustment before going ahead. Much of her energy was spent upon this procedure every other step or so. At first I hoped that exercise would help strengthen her legs, but as her body grew bigger they got worse. Often I would find her sitting with them spread out on either side of her, and sometimes they would even get caught in her wings, causing her terrible confusion and distress. One day I noticed that certain parts of her legs and feet were a greenish-blue, and wondered if she had some disease. I’d been thinking lately that even if she were not in actual physical pain, which I wasn’t sure of, she was still in some kind of acute misery, for she acted as though she was. She hid her face in corners more and more as the weeks went by, and ordinary efforts like eating and turning around were increasingly done with a commotion which left her exhausted. One of the most touching things about Viva was her voice. She would always talk to me with her frail “peep peep” which never got any louder and seemed to come from somewhere in the center of her body which pulsed her tail at precisely the same time. Also, rarely, she gave a little trill. Often after one of her ordeals, I would sit talking to her, stroking her beautiful back and her feet that were so soft between the toes and on the bottoms, and she would carry on the dialogue with me, her tail feathers twitching in a kind of unison with each of her utterances. I decided to have her looked at, so I made an appointment and on a Saturday morning took her in a bed of straw in a cardboard box to the veterinarian’s office an hour away. She spread out Viva’s wings and showed me that the undersides were black and blue like the blotches in her legs and feet. She said that because of her struggle with her condition, Viva’s body was full of wounds, inside as well as out. I asked, what is her condition? And she said Viva suffered from a congenital leg defect, called splay foot, an inborn weakness in her joints typical of birds bred for the modern food industry. She said Viva should be euthanized and that she would use an inhalant, which is more gentle than the usual leg injection. She had to look in on another animal just now which would give me time to spend a last few minutes alone with my friend. I pulled up a chair next to the box on the table with Viva in it. Just then a young veterinary aid rushed in, “Where is it? Can I see it? I’ve never seen a chicken,” she said making for the table. She left. I thought my heart would burst. Viva was very peaceful, and when I spoke to her she piped back in the way that she had, her little tail pulsing its perky beats, from somewhere inside. The veterinarian took Viva away. Later, as I was leaving, she said that Viva would not die fast enough so she had to use a leg injection after all. She thanked me for caring about a chicken. I placed Viva in the car on the front seat beside me. The box in which she had traveled alive she was carried home dead in. My husband and I dug a hole in the corner of the yard and laid her inside. We covered her up with the dirt. I made a note on the inside cover of my dictionary: On Saturday, November 28, 1985, soft Viva died.